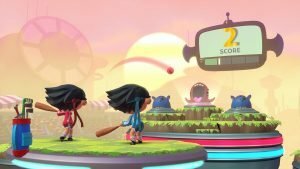 The developers behind Guitar Hero and its sequel, as well as all the Rock Band titles, Harmonix is back, and this time its brought us a cute family friendly rhythm game exclusively to the Nintendo Switch. 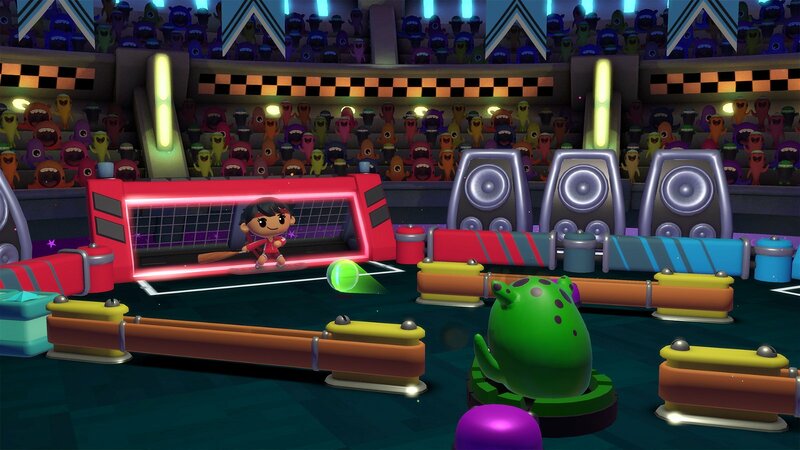 Thankfully, unlike the developer’s last few titles, I think this Super Beat Sports is great! The premise is simple, and so is the gameplay, but that isn’t a bad thing at all. 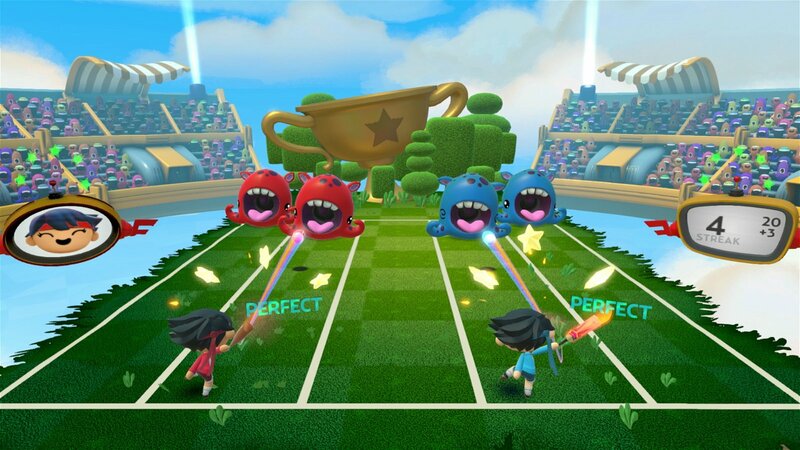 Music obsessed aliens come to earth after seeing sports broadcasts and befriend/challenge players to five different musical sports-themed mini-games in Super Beat Sports. Whacky Bat has players switching between lanes and smacking balls back at aliens as they toss them out to the beat. The normal difficulty has three lanes while the pro difficulty has five. Playing with two players means only hitting balls back at aliens that match the assigned colours of each player, as well as a mechanic where one player stands atop the others head to properly hit balls back at a floating alien. Whacky Bat has the most songs to complete of any of the minigames in the collection at 27, all of which were composed specifically for this game. While you won’t find any licensed tracks here, I’m more than okay with that as the songs are catchy, and the ‘singing’ of the aliens is cute, almost like one of the Minions from Despicable Me. Net Ball is essentially volleyball that can be played with an AI partner or another player. Instead of moving between lanes and repeating after the aliens like in Whacky Bat, here you’re ‘playing’ the next note in the song while standing in place. It is a little less involved than Whacky Bat, but just as entertaining. 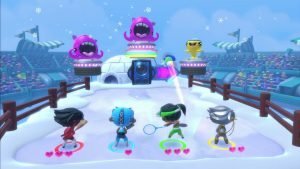 Net Ball has a selection of 15 songs, all of which are exclusive to the mode. Gobble Golf is perhaps the simplest mini-game of the bunch, and also the worst. Aliens are positioned across three different platforms—left, middle, right—and will open their mouths to the beat at which point you’ve got to golf swing a ball in. Instead of this being done on the fly, the game first plays out an entire measure of music and shows you when aliens will open their mouths, then repeats so you can hit balls in. This happens nine times across nine rounds per song. While the intro of each round can be skipped, it never feels challenging at all since you’re provided with multiple attempts per round. Where the other mini-games feel a bit more skill based requiring you to listen to the beat, Gobble Golf just feels like connecting the dots or following the breadcrumbs as you’re told to. Thankfully Gobble Golf has the fewest songs available at 12. Buddy Ball can be played solo or with up to four players as one of the two multiplayer competitive modes. 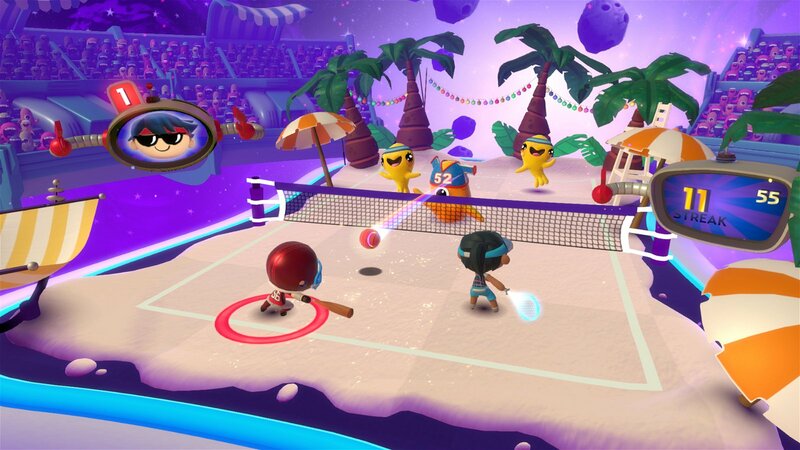 Players stand in a line and take turns hitting the ball in order while aiming at one of three aliens on the screen. Miss a swing and you lose one of three lives, and losing all three lives means you’re eliminated from the game. Last player standing wins. Buddy Ball is pretty simple but requires a lot more reflexes and strategy than any other mode in Super Beat Sports. 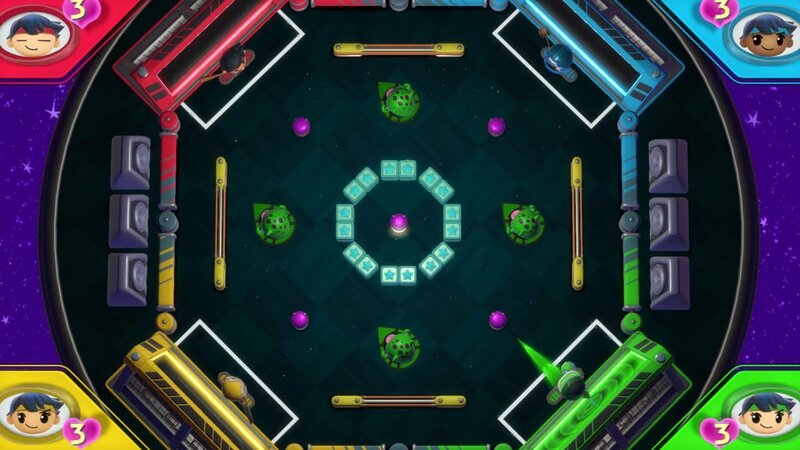 Not only do you have to decide which aliens to aim for, which impacts the movement of the ball to the next person in line, but it could also spawn or activate power-ups such as switching the rotation direction or hazards such as a bomb that will cost any player that hits it a life. It’s a shame there are only four songs available, but things get so frantic that I doubt many players will be thinking about the music at all. The final mini-game in the collection that also features competitive play for up to four players is Rhythm Racket, basically a musical combination of Pong and the lesser known Warlords. Players have a net they must defend from a ball being bounced across an arena in a top-down view. The ball can be bunted to slow it down, swung at to speed it in the direction you’re aiming, or tossed up in the air and served to speed it off smashing through blocks. Hit it through the other players’ nets until their lives are depleted and you win. 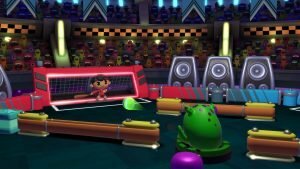 Rhythm Racket doesn’t put nearly as much emphasis on the music as other modes, only requiring timed presses for serves, and to blast it out of aliens mouths that scatter the arena which is controlled by whoever the last to serve the ball was. The arena changes after any player loses a life, which constantly switches up strategies and keeps the game fresh, even if there are only three songs available for this mode; as I’ve said, not so important here. Rhythm Racket is pretty fun, frantic, and has a bit of a learning curve in comparison to any of the other mini-games—which is why the game forces you to play a tutorial for it the first time you start the mode—but I could see this being the hit mode at parties between competitive friends. As a veteran player of the genre myself, I preferred each mini-games pro modes as the normal difficulty was a bit too easy for me; though I wouldn’t call any of this game challenging. Unlike some of Harmonix’s previous titles, Super Beat Sports gives a lot of leeway when it comes to timing button presses to the beat with any press that would connect with the ball being perfect, and swings that would miss but are close being early or late. That said, those looking to perfect every song and mini-game will still be in for a challenge, just don’t expect something like the notoriously hard ‘Through the Fire and the Flames’ on expert difficulty as found in Guitar Hero. Players like myself that enjoy goals to work towards in games fret not, as there are a ton of unlockable costumes and equipment that can be used to customize your character. You’ll find normal sports equipment like bats, clubs, and rackets as well as some more jokey items like lawn gnomes. While none of these impact the gameplay, the sound of your equipment hitting balls changes based on your equipment. Unlocked from the start is the ability to change your character’s skin color, which should practically be standard at this point but isn’t in most games. As far as other little features go, the game can be played with any variety of controllers including single Joy-Cons and Pro Controllers. There isn’t online or leaderboards, but Super Beat Sports offers local wireless play, which I was not able to test for this review. Like most games, the HD rumble here wasn’t anything fancy or really even noticeable. The game works great in both handheld and docked modes with no visual hiccups in either, though I’m not sure cramming four people around a 6.2-inch screen will ever be a viable option. 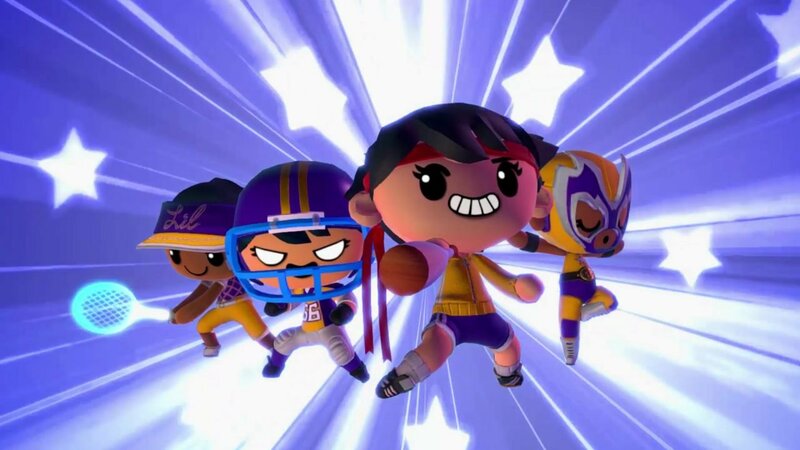 The cherry on top of Super Beat Sports is its adorable cartoon-like style that reminds me of shows like Gumball and Steven Universe. All the characters are colorful and huggable, but especially the aliens. 2017 has turned out to be the cutest year in gaming and, frankly, I hope the trend never stops. For $15 Super Beat Sports offers a wealth of content, as well as some great couch co-op and competitive gameplay. While it doesn’t reinvent the rhythm genre, it at least tries and succeeds to do something at least a little different with it. Great solo, great with friends, easily recommendable even without popular licensed tracks. 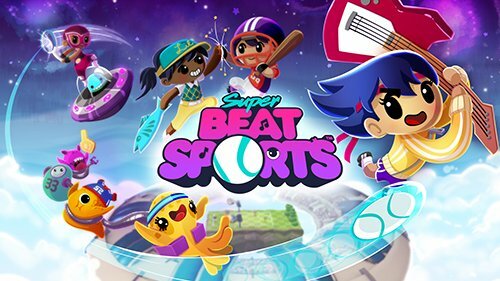 Super Beat Sports succeeds at doing something familiar but fresh with the rhythm genre and is a blast to play with friends.